The trocaire boxes are being collected on Thursday morning 11th April before 10.30am. Please do not bring in the boxes after this date. 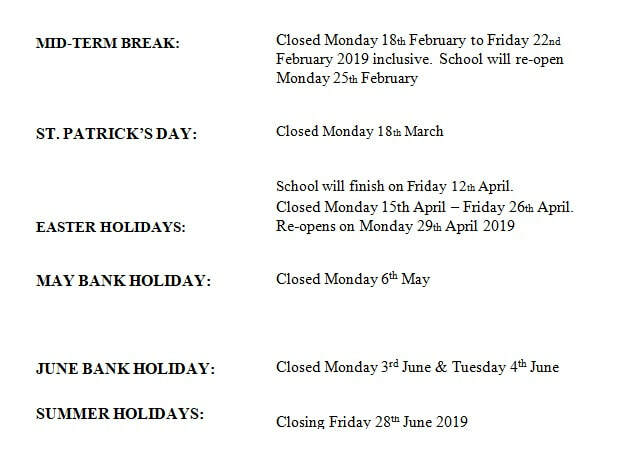 The school will close this Friday 12th April at 12.15 pm for the easter holidays. Please collect children promptly. We will re-open on Monday 29th April at 9 am. The school is closed Monday 25th March for a staff in-service day. We will re-open at 9 am on Tuesday morning. ​Mr Minnocks 6th class boys are making Candles this year as part of their Junior Entrepreneur Programme. 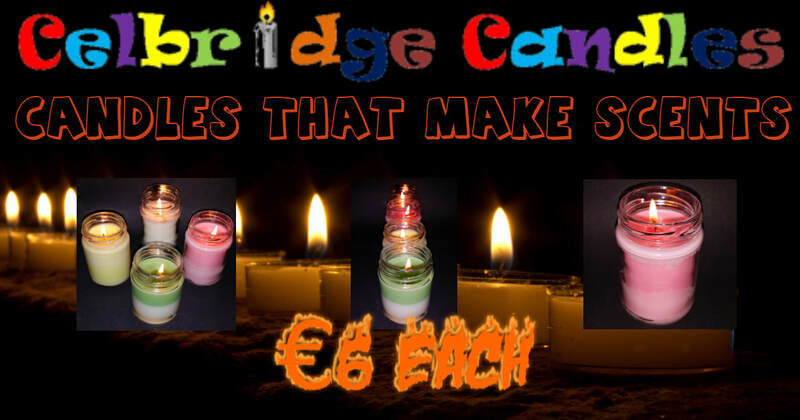 Trading under the name 'Celbridge Candles', Candles That Make sCents, the boys are now taking orders. Order forms have been given out to all classes, or can be found on their brand new website https://celbridgecandles.wixsite.com/info. The site also highlights the range of products available aswell as a step by step guide showing how the boys make the candles. The candles are all naturally produced using 100% Soya products and scented in a range of flavours are favourably priced at €6 each when compared to our leading competitors in the scented candle market. This week's jackpot was worth €4,600 and took place on Friday 18th January. There was no winner of the jackpot. This weeks winners of the €50 were M Campion Waters and N Vennard. The numbers drawn were 3,4,14 & 27. If you wish to take part in our next draw, choose 4 numbers between 1 and 28. The cost is €2 per line. Please do not put your child's name on the envelope, as you need to be over 18 to play. We would ask parents to please support the lotto. 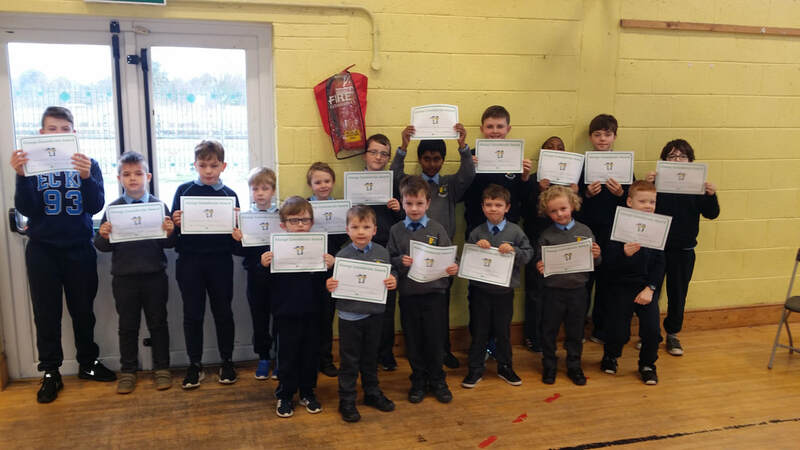 ​The enrolment for new junior infants 2019 for all of the schools in the parish is on February 13th and 14th between 10 am and 1 pm. Please bring along your child’s birth certificate and two utility bills on the day. A baptismal cert is not required. The new admissions policy which is now available on the website does not require a baptismal cert for enrolment. As yet we have not been given permission to go co-educational. We have been in contact with the Department and we are hoping they will give us confirmation before the enrolment date. So until we are given sanction from the Department we will continue to only enrol boys. This week's jackpot was worth €4,500 and took place on Friday 10th January. There was no winner of the jackpot. This weeks winners of the €50 were L Waldron and C Mc Hale. The numbers drawn were 3,7,13 & 27. If you wish to take part in our next draw, choose 4 numbers between 1 and 28. The cost is €2 per line. Please do not put your child's name on the envelope, as you need to be over 18 to play. We would ask parents to please support the lotto. Having composed their own Christmas Song over the last few weeks, the boys from 6th class were invited to KFM to perform it live on Friday. Ben was interviewed by Ciara from the station and represented the school brilliantly. 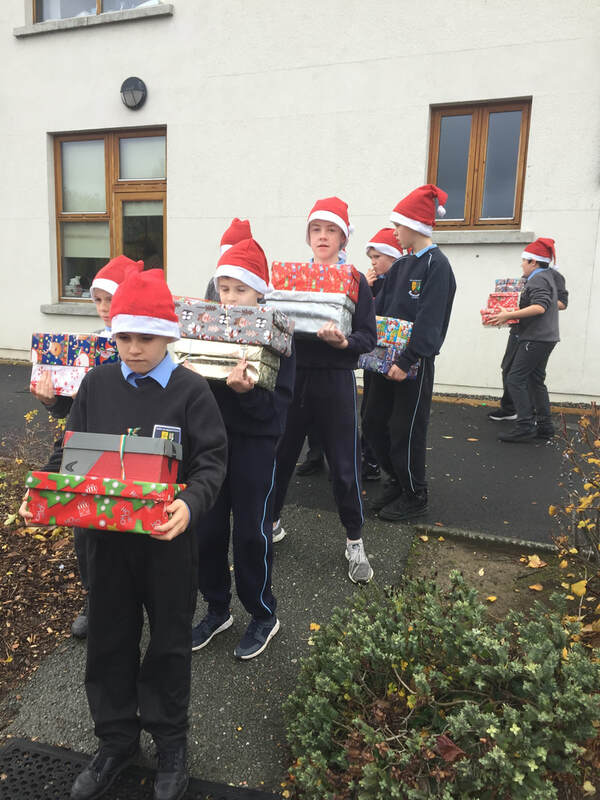 We had a fantastic response from the boys to our annual Team Hope, Christmas Shoebox Appeal. Thanks to everyone who donated presents, they will be warmly accepted in homes all over the world. Huge thanks as always to Mary Shaw for organising the collection every year. Mary puts a lot of time and effort into organising this which will make so many boys and girls very happy this Christmas. This week's jackpot was worth €4,100 and took place on Friday 30th November. There was no winner of the jackpot. This weeks winners of the €50 were J Leahy and A McArdle. The numbers drawn were 2,14,27 & 28. If you wish to take part in our next draw, choose 4 numbers between 1 and 28. The cost is €2 per line. Please do not put your child's name on the envelope, as you need to be over 18 to play. We would ask parents to please support the lotto. We had a fantastic morning in Scoil Na Mainistreach this morning with the launch of the Daily Mile Ireland. Elaine Wyllie the founder of The Daily Mile and TV Presenter Ray D'Arcy were on hand to launch this fantastic initiative. Ray had some very nice things to say about the boys and the school on his radio show this evening. Click on the link above to download his the 2 minute piece from his show. Kildare Sports Partnership, Athletics Ireland, Sport Ireland, Celbridge AC, Castletown parkrun and Celbridge GAA Club were represented along with many other invited guests. 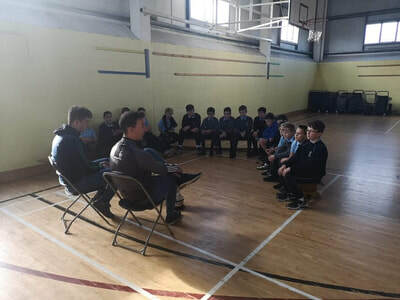 After a gathering in the hall for all boys, 5th and 6th Class boys completed a number of laps of The Daily Mile.Thanks to our Parents Association for organising the pre and post launch reception for all guests. 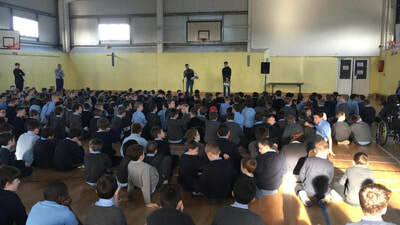 ​As usual the boys of Scoil Na Mainistreach were fantastic and were rewarded with a night off homework. 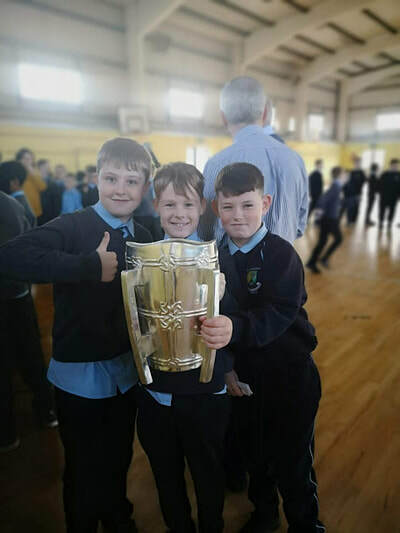 A team of 6th class boys featuring drone Pilots, Cameramen, Video Editors amongst others, put together a video compilation to capture the occasion. Well done boys, top class as always. Monday next, 19th November promises to be a day to remember for the boys of Scoil Na Mainistreach. The Daily Mile, a nationwide initiative to enhance the fitness levels of all pupils will be launched in Scoil Na Mainistreach. Begun in Scotland in 2012, The Daily Mile has over 3000 schools across Scotland, England, Wales, Belgium and The Netherlands signed up to participate. Members of Kildare Sports Partnership, Sport Ireland and Athletics Ireland will be in attendance on the day to launch the initiative. 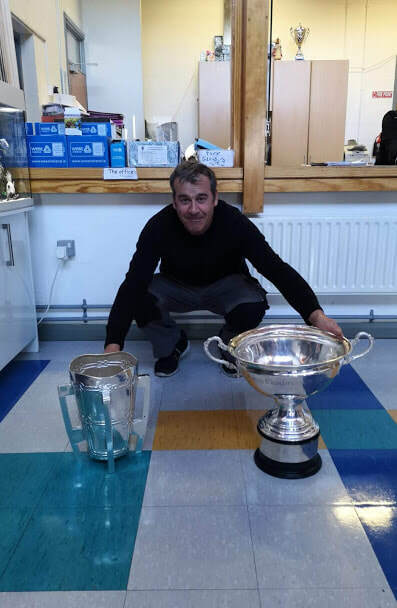 Among the guests present will be TV / Radio presenter and Chairman of Kildare Sports Partnership Ray Darcy along with the founder of The Daily Mile, Elaine Wyllie, who will travel from Scotland for the occasion. 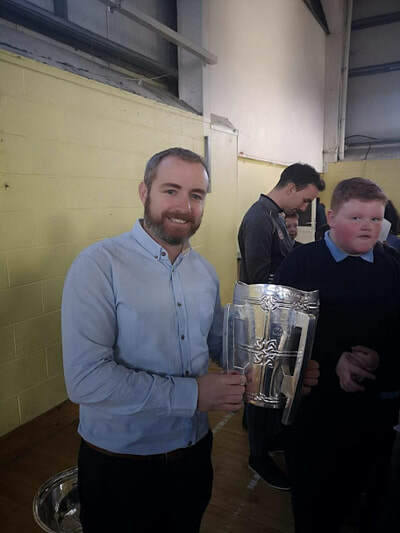 Scoil Na Mainistreach have also invited representatives from Celbridge Athletic Club and our local Castletown parkrun with whom we have built up a strong partnerships in recent years. All pupils will gather in the hall for a special assembly to welcome our guests on the day. 5th and 6th class pupils will then embark on The Daily Mile following a route around the school. 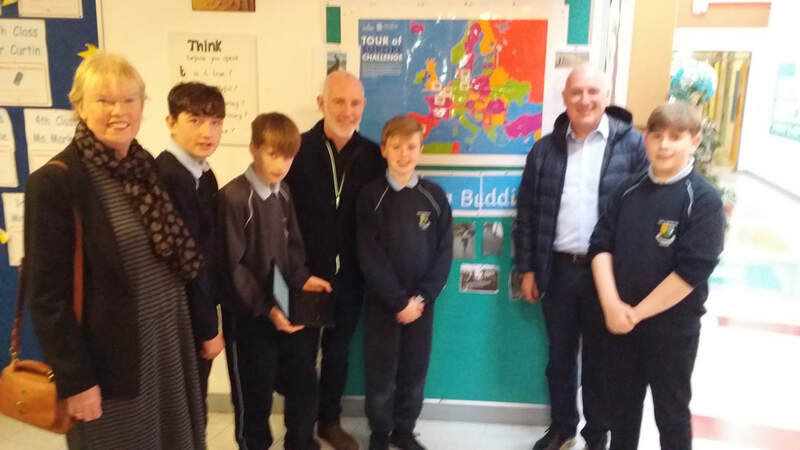 Pupils in the school are familiar with the route as we have had our own had our own Lillywhite Lap and the recent Run Around Europe initiative taking place on a daily basis. 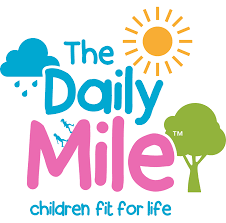 Below is a video of The Daily Mile founder, Elaine Wyllie discussing the background to the initiative and how she believes it will improve the fitness levels of children. 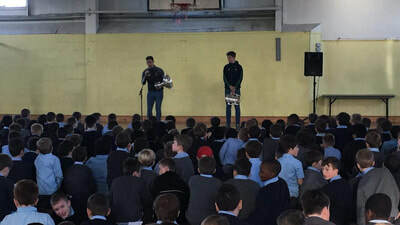 Just over 16 years since his last visit to Scoil Na Mainistrech, Liam MacCarthy returned to visit the school in the hands of Limerick Hurler David Reidy. Ms Marken, a club colleague of David Reidys helped to organise the visit and there was great excitement amongst all in the school community in anticipation of this special visit. 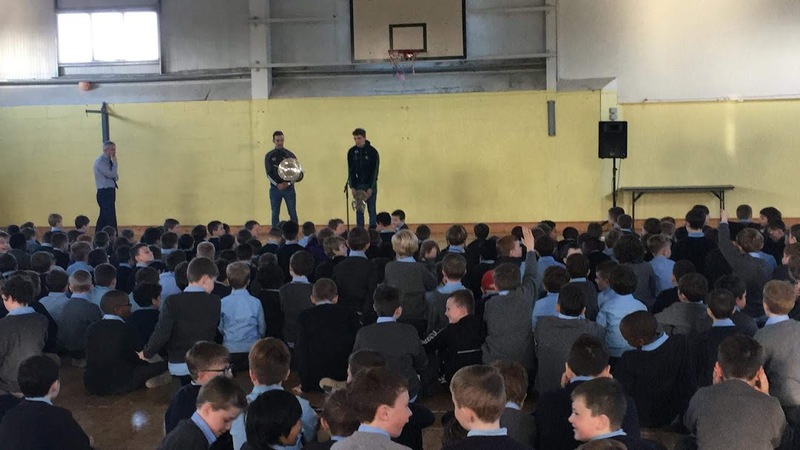 The visit was made all the more special as accompanying the Limerick man was Kildare Star Hurler Martin Fitzgerald, carrying the Christy Ring Cup, won by Kildare Senior Hurlers this Summer. 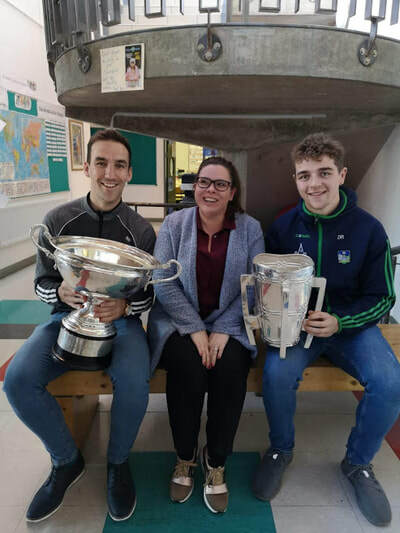 The boys and teachers gathered in the hall to greet the 2 visitors and gave them a great Scoil Na mainistreach welcome. 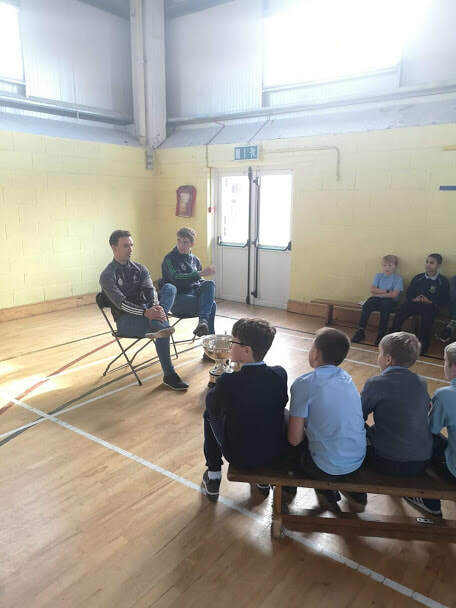 Following the reception in the hall, some of our school hurlers had a special audience with the two Hurling Champions and picked up some valuable tips. 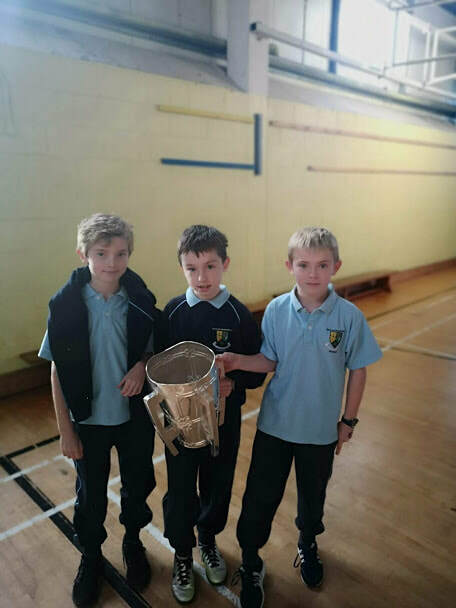 A number of players on the Celbridge Senior Hurling Championship winning team this year were pupils in Scoil Na Mainistreach in 2002 when the cup last came to visit. 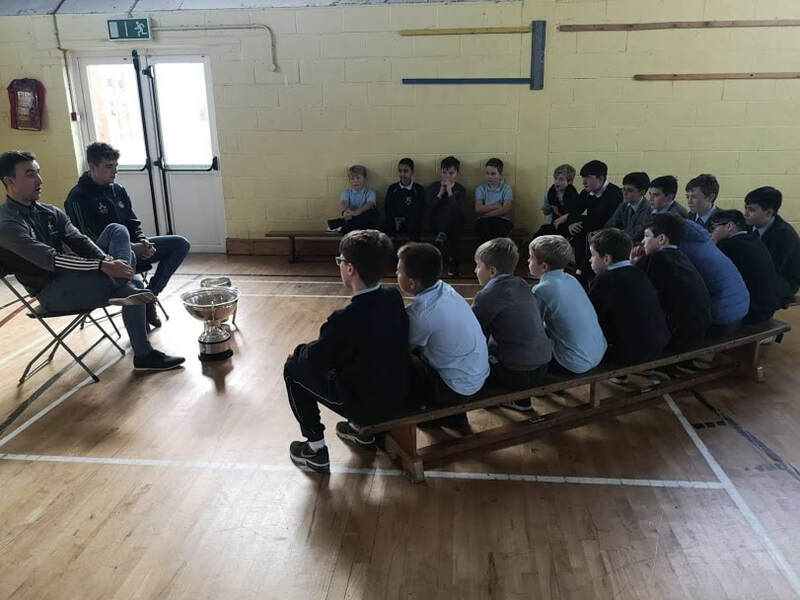 Who knows a few of today's pupils might have been inspired by this visit and go on to represent Club and County in the small ball game for years to come. Many thanks to David and Martin for giving so generously of their time and allowing the boys to experience a special occasion. 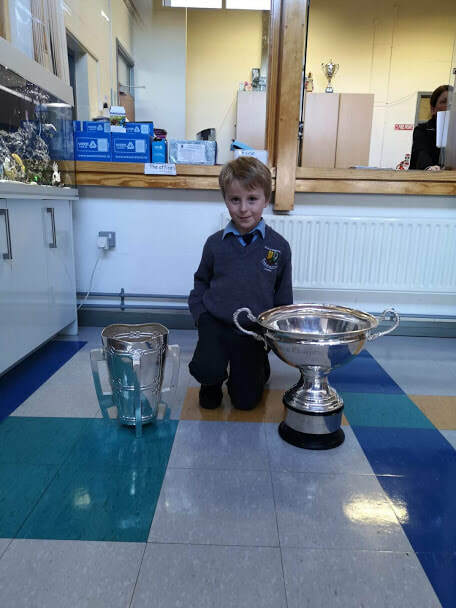 Thanks also to Ms Marken for helping to organise the visit and we hope to see many more cups visit the school in the years to come. This week's jackpot was worth €3,600 and took place on Thursday 25th October. If you wish to take part in our next draw, choose 4 numbers between 1 and 28. The cost is €2 per line. Please do not put your child's name on the envelope, as you need to be over 18 to play. We would ask parents to please support the lotto. This weeks winners of the €50 were J Cheevers and M Liscombe. The numbers drawn were 2,3,6 & 24.